Your challenge is to design this Plecticle. The only restriction imposed upon you is that the Plecticle has to fit inside the dimensions specified for the box. done to solve the problem. team of six scientists that can get to any point in the globe while travelling at extreme speeds. It can fly, float or travel on land (or a combination) but must not harm the environment in any way. The craft will need to be able to withstand the heat of the desert, the arctic conditions of the polar ice caps, be ableto climb the highest mountains and dive to the deepest ocean floor. The craft also needs to be able to collect data about these different places, plus physical samples, and store them safely. What are the Audi Innovation Awards? Audi Innovation Awards are the national design competition for all students aged 11–14. This is your chance to win lots of fantastic prizes, including a laptop, design software and WHSmith vouchers worth hundreds of pounds. Many designers are asked to improve upon existing technologies to create the next big thing! This is very true in the music industry. Over the last 10 years we have seen vinyl record players, cassette tape players, CD players, mini disc players and MP3 players. But what will come next? 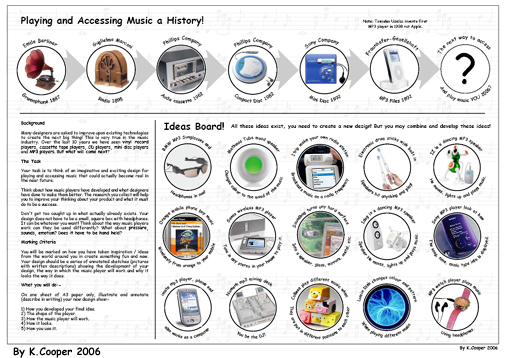 Your task is to think of an imaginative and exciting design for playing and accessing music that could actually become real in the near future. Think about how music players have developed and what designers have done to make them better. The research you collect will help you to improve your thinking about your product and what it must do to be a success. Don't get too caught up in what actually already exists. Your design does not have to be a small, square box with headphones. It can be whatever you want! Think about the way music players work can they be used differently? What about pressure, sounds, emotion? Does it have to be hand held? You will be marked on how you have taken inspiration / ideas from the world around you in create something fun and new. Your design should be a series of annotated sketches (pictures with written descriptions) showing the development of your design, the way in which the music player will work and why it looks the way it does. 1) How you developed your final idea. 2) The shape of the player. 3) How the music player will work. 5) How you use it.